This module supports the continuous updates of production plan, material procurement plan (MRP) and sales plan. Our planning program is not calculating one variant only, it is a tool, which will help to your planners with changes in your current plan according to their skills and experience. Advanced Planning System (APS) is used for planning with limited capacity and it is defined by calendar shifts for each workplace. Capacity can be set up by planned or unplanned downtimes for each machine. Planners are able to work with all operational changes in production plan. Production plan can be available in several variants. All approved plans are viewable for other users. Foremen are able to plan work-schedule and print production orders and dispatch notes. All scheduled actions can be divided in several batches and they can be merged back. Downtime scheduling support is included. 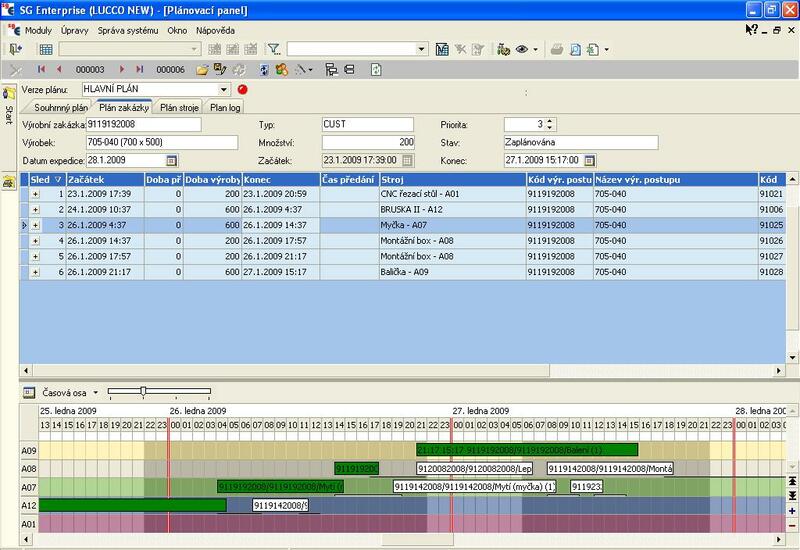 Scheduling module supports single/multi stage production. It can be configured for batch production, small scale production or unit production. Shorten lead time for orders. More precise control of material requirements. Higher utilization of capacity for bottlenecks. Fast detection of all terms of contracts. Comfortable and easy creation of manufacturing processes and bills of materials. Visual display for BOMs and production processes via an intuitive diagram. Support different units of measure. Variant BOMs and production processes. Central management for manufacturing processes, production sites, centers, machines and final workers. Versioning and electronic storage for drawings and other documents via built-in SG Document Management System module. Specifiable plan – work scheduling for workplaces/departments is performed via an intuitive symbols moving process to the rows of the respective workplaces/departments. Shorten production lead times. Planning panel supports searching for shorter lead times for key contracts and optimizing the utilization of workplaces – bottlenecks. All scheduled tasks and also on-going operations are displayed – based on the real data from production. This tool provides information about sales plan – based on the specific production plan. Planners are able to prepare production orders according specific data from salesmen. Dispatch department has all relevant information for future loadings. Provides all relevant information about material purchasing according future orders. Material Resource Planning with current data (material entry) is provided by Operational Warehouse program. 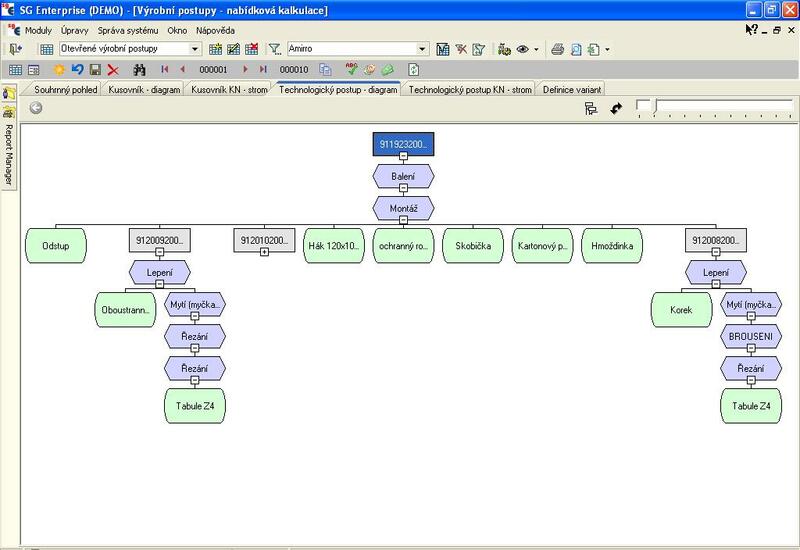 Warehouse and orders can be automatically connected to other ERP systems.